An extra seat would be available if the four persons ACTS would be developed befor the Shuttle retirement. Although I don't see this happening before 2014.
advanced crew transportation system - RSA/ESA joint venture to develop a new vehicle. Its in a bit of a political quagmire at the moment. If I wasa betting man then Id say if anything comes from it, its going to be a Guyana launched soyuz with some technology from ATV and maybe the zond heatshield. But thats a guess, and proably too optimistic. There seems to be another way to go that people are often forgetting about. As someone else has mentioned on another thread, the next generation of Soyuz (starting 2008) will be certified to stay on orbit for 1 year. That means you could just leave the flight rate at 2 Soyuz per year and increase the crew rotation periods from 6 months to 12 months. That said, Soyuz flight rates of 4 per year are not a condition for a permanent crew of 6. The real bottleneck are Progress flights which will have to be increased from currently 4 a year to at least 6 a year. I believe the real plan is to continue the 4 Progress per year, and have ESA pay its common ops costs via cargo transport on ATV, and for JAXA to do the same with HTV. 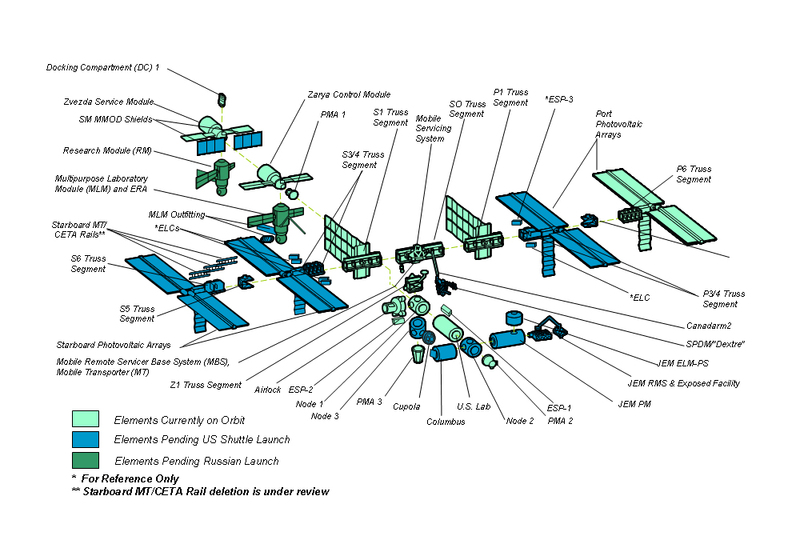 That is how they get to a 6 person crew; excepting that its TBD how 4 Soyuz a year get paid for. If ATV is successful, it's probably worth at least a couple of Progress vehicles per year (supplies/gasses/thrust), so I can't see a need for extra Progress flights for a 6-person crew, in that case. Also, don't forget JAXA's supply vehicle is within that period (assuming it finishes development and flies within the current projected schedule). With the high oil and natural gas prices Russia is making a lot of money. Ofcourse how the money is divided is always a hot issue. I watched the latest ISS assembly video on www.nasa.gov and I saw several elements that are not included in the latest ISS Configuration model. Which are the components in red on this screen shot and what are their functions? So the ORUs will contain CMGs, pumps and other stuff of that sort? Who docks and undocks the Progress ships - the ISS crew or the ground control? automatic afaik. Manual back up by Tyurin if things go wrong. Indeed, the ground has no capability for real-time remote control. AFAIK undockings are normally pre-programmed from the ground. Of course, the crew still has to button up the hatches etc. beforehand. With the new truss segment, are there new cameras available that are farther from the center of the station than the previous cameras? I was wondering why the views of the latest Progress docking could not image the approaching vehicle (on the -V bar). The best view would be from the aft Zvezda (SM) windows. Thomas Reiter made some photo's of the approaching Progress out of the Zvezda windows. The external TV camera's can't be placed further out or else they would be (in future anyway) rotating all the time. I am still trying to find a photo of that aft window! After some searching I found a Zvezda details page with near the bottom a number of detailed drawings of Zvezda. In the 'Forward view' you can see Window 26 which faces aft. Yep, there it is, thanks.